Wood-fired, retained heat ovens have been used for millennia all around the world to bake everything from bread and pizzas to meat and vegetables. 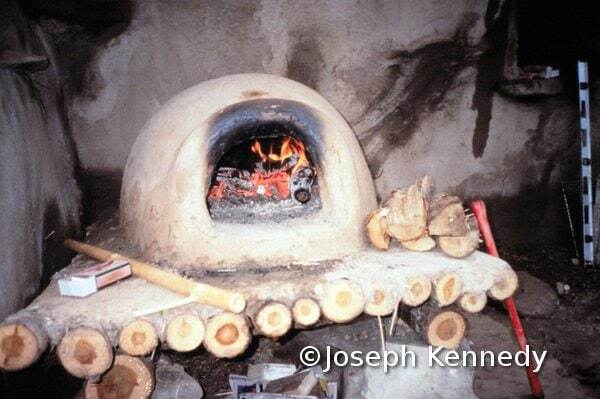 These dome-shaped ovens can be made from many different masonry materials, including stone, fired brick, and adobe block. I learned a simple but effective technique for building mud ovens from Ianto Evans. The floor is made from bricks for greater heat retention and durability. On top of the brick floor, I make a pile of damp sand the size and shape of the interior of the oven. Over that goes a layer of high-density clay-sand about 3” thick. This inner dome is covered in turn with a thick insulating layer of straw-clay. When dry, the outside of the oven can be finished with earthen plaster or covered with a cob sculpture. Ovens are fun and relatively simple to build, and make a great starter project for aspiring natural builders. They also bake much better bread and pizza than a standard low-mass convection oven. I have taught over 20 one-day or two-day oven building workshops, and I’m always looking for new sites for building ovens.